The most precise indication is from Tartini’s experiments with strings: he was said to have a total string tension of about 30kg on his violin in 1734 (which translates to an E string of at least 0·65mm at A = 415). By way of comparison, a Dominant violin set today totals 22·1kg! 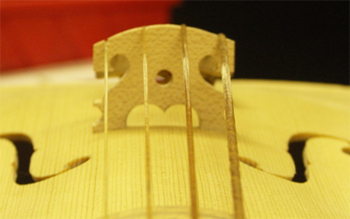 Mersenne’s comparisons with lute strings in his Harmonie Universelle of 1636 indicate a violin E of about 0.77mm. More subjectively, the violin sound is described as “crude and harsh if not tempered and sweetened by dulcet bowing” by the Italian Rognoni in 1620. This describes accurately the sensation of bowing very thick strings: great power can be achieved with skilful use of the bow, but care needs to be taken! It should also be remembered that the increased thickness of the lower strings required by equal tension will mean a greater overall string tension (unless an exceptionally thin E string is chosen). In all, Baroque music would be better served if we forgot the idea of Baroque stringing being lighter. The precise level of tension, however, is very difficult to determine because it depends greatly on individual instruments and their set-ups. Therefore the most effective method of choosing the correct gauges is actually trial and error! If experiments are informed by a good understanding of the basic principles of Baroque stringing they are more likely to be successful. There is usually a clear maximum, beyond which the instrument seizes up, and the trick is to back off from this point sufficiently to ensure a good, ringing free tone without losing the depth and volume. Equal tension changes the tone quality because of the thickness of the lower strings in particular. This gives a deeper, more substantial sound, with what is often described as a “nutty” or “gritty” quality. In addition, all gut stringing changes the tone quality because the lowest string now matches the other three better, being of the same material. The sound of a gut violin G is not overly resonant, but it has a full, satisfying quality which if well used can be effective in ways that the wound G cannot. An all gut, equal tension set-up is much more conducive to good blending, both within the string family and without. A string consort will be more effective with equal tension because equally balanced instruments mean there are no “holes” in the texture where individual instruments have weak points in their range. And when the string consort sounds like a true family, it will be a more effective counterpart to other consorts such as cornets and sackbuts, shawms and dulcians or recorders. This can be heard particularly clearly in the consort pieces in the Duke of Lerma recording from 2001. Increased string tension allows a greater volume of sound to be drawn from the instrument. The same effort with the bow will produce more sound; in addition, the maximum volume achievable will be higher. On well-made, thick gut strings, the articulation is a revelation. A far greater range of attack and decay of each note is possible. It becomes much easier to create the effect of “speaking” in music, imagining each bow stroke as a syllable, with different consonants to begin each one. This is of course in keeping with the rhetorical approach to performance considered as the highest ideal in the Baroque era. Rhetoric has become something of an overused word in recent years; however the reasons for this are sound! Almost everyone who wrote about music, as performer, teacher or theorist, made the same point: that the goals of the musician and the orator are the same – to use their art and skill to move the listener to certain emotions (“passions”) at certain times, in accordance with the meaning of the text. This subject is explored in extensive and lucid detail by Judy Tarling in ”The Weapons of Rhetoric”, Corda Music, 2004. From the player’s perspective, the instrument takes on a different “feel” altogether when strung in equal tension. The resistance of the strings under bow and fingers is much greater, and this can raise interesting questions about technique: it is necessary to think very carefully about bow-speed and bow control in general. In the beginning this means a bit of experimentation, and it can be taxing for a busy professional to re-think his or her long-practised technique. However, the difference between a conventionally strung Baroque violin and one strung historically is in my view almost as great as the difference between a modern and a Baroque violin, and just as the effort required for mastery is considerable, the rewards are great, and ever expanding. The most important point to take away from this is that good stringing (and indeed other aspects of historical set-up) is not merely a matter for pedantic historians and perfectionists; rather it is something which can bring us in tune with the musical ideals of the period. Once we understand how a well set-up Baroque violin works, it is so much more natural to find the means of expression which bring Baroque music to life. Articulation, phrasing, balance and blend fall into place and this makes our job as performers both easier and more satisfying. Click here for a reading list in printable PDF format. If it does not open, you may need to download a free PDF reader. One of the obstacles to effective historical stringing has been the quality of strings available: equal tension requires thicker strings in the lower registers, and this is a real test of string quality. Sub-standard thick gut strings tend to be slow to speak, scratchy and suffer from pitch distortion: to overcome these problems a string needs to be very flexible (“bendy”) and very elastic (“stretchy”). The best way to achieve this is to make sure the strands of gut are as highly twisted as possible in the final product. George Stoppani has developed a method of string making, based on historical principles, which meets these needs. Oliver Webber and fellow violinist Steven Rouse have joined him as assistant string-makers, and “Real Guts” now produces a small but significant quantity of very highly twisted plain gut strings, which work especially well at the thicker diameters required by historical stringing. “Real Guts” will be at the Early Music Exhibition in Greenwich on 10-12 November 2006. There will be a recital and instrument demonstrations (featuring the Monteverdi violins), CDs for sale, consultations and “string doctor” sessions, as well as, of course, strings for sale. For detailed references, see Webber (1999), pp 8-9. More details available in Webber (2006), p5. Full details in Webber "Real Gut Strings: Some New Experiments in Historical Stringing", The Consort, Vol. 55 (Summer 1999), pp 8-9.